Waterproof Chair Pad 21" x 22"
Priva Soff-Quilt Reusable Chair Pad keeps chair clean, dry and looking new. 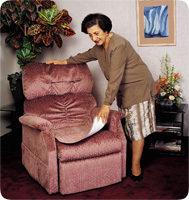 Absorbent inner layer and vinyl backing shields seating surface from fluid damage and soiling. Cuts down on the need for costly professional steam cleaning. Protects sensitive skin from moisture. Priva Soff-Quilt Reusable Chair Pad is ideal for chairs, cars and wheelchairs. Surface is 100% nylon with a 100% polyester inner lining and backing. Soaker is 65/35 polyester and rayon blend. Absorbs up to one cup. ReliaMed Reusable Chair Pad 21" x 22"